About this Wet Wipe Packet:Contains 10 Wipes.Meets FDA Requirements. About this Mini Wet Wipe Canister:Contains 30 Wipes.Bead Chain Attachment.Lightly Scented.Meets FDA Requirements. About this Tissue Packet:Contains 20 Tissues. About this Pocket Size Wet Wipe Canister:Bead Chain Attachment.Meets FDA Requirements.Contains 10 Wipes. About this Alano Antibacterial Wet Wipes:Resealable pack of 10 antibacterial wet wipes are non-alcohol based and FDA approved. Finish / Material: PE Plastic. Ingredients: Water 94.50%, Propylene Glycol 2%, Kathon 1.50%, Benzalkonium Chloride 1.00%, Aloe Vera Oil 0.50%, Vitamin E 0.50%. About this Antibacterial Wet Wipes, Full Color Digital:Unscented. 15 wipes per container.Special Instructions:3 Day Rush: 1 location imprint. About this Cube Tissue Box:Includes 80 virgin pulp tissues. Standard size cardboard pop-up dispenser. Imprint is on sleeve that surrounds tissue box. About this Antibacterial Wet Wipes in Pouch:Wipes are made from non-woven polypropylene, and the pouch is made of foil. Antibacterial disposable wipes in a resealable pouch. Gently scented, alcohol-free formula. Each pouch contains 15 wipes and meets FDA requirements. About this Bug Repellent Wipes:10 wipes per package.Pleasant citronella scent.Full Color Digital Label.Active ingredient: Citronella Oil (4.0%), Lemongrass Oil (4.0%), Peppermint Oil (2.0%)Once the repellant is applied, it last for 6 hours..Special Instructions:3 Day Rush: 1 location imprint. About this Travel Pack Anti - Bacterial Wipes:Contains 10 Non-Alcohol formula anti-bacterial wet wipes. These disposable wipes come in a resealable soft pack. Features a white scratch-resistant label that can be customized with a four-color process imprint. Material: Plastic.Special Instructions:Less Than Minimum orders not available.Add $45.00 per box for hazardous (alcohol based) air shipment fee. (Air shipments only available in contiguous U.S. states and cannot ship ground to Puerto Rico,Alaska, Hawaii. Hand sanitizers not available for sale in Canada.All hand sanitizer air shipments must ship via UPS. About this Mini Cube Tissue Box:Includes 30 petite virgin pulp tissues. Mini size cardboard pop-up dispenser. Imprint is on sleeve that surrounds tissue box. About this Mini Tissue Pack - Goofy Group(TM):Features re-sealable backside closure. Includes ten 3-ply virgin pulp tissues! About this Mini Tissue Packet - Doctor and Nurse:Features re-sealable backside closure. Includes ten 3-ply virgin pulp tissues! About this Tissue Pack, Full Color Digital:Compact wallet size. 10 tissues in each pack. Stock FDA info printed inside. About this Mini Canister of Wet Wipes:Antibacterial disposable wipes in a mini can sized container with snap closure lid. Gently scented, alcohol-free formula. Each can contains 24 wipes and meets FDA requirements. Includes attached ball chain. About this Car Cup Box Facial Tissue:Includes approx. 80 2 ply tissues per box. Fits into most cup holders. Box made of Heavy weight 400 gsm cardboard. Tissues each measure approx. 5.31" x 7.67". Patented.Special Instructions:Rush : 1. Catalog quantities only.2. Valid only for the standard number of imprint colors/positions included for each item. About this Mini Tissue Box:Convenient and customizable, our mini tissue box offers a 360 view of your brand for maximum exposure. With 30 in each mini box, our two-ply tissues are a great leave behind for hospitals, assisted living facilities, funeral homes and more. Decorated on all sides in full color, this item is perfect to attach your brand to. About this Pocket Tissue Pack:Perfect for everyday sniffles, our pocket size tissue package includes 10, three ply tissues. Add your full-color logo and message to the pack and you have a practical giveaway. Ideal for gift shops, tradeshows, health fairs and much, much more. About this Portable Tissue Pack:Perfect for everyday sniffles, our pocket size tissue package includes 10, three ply tissues. Add a full-color Decal to the pack for maximum exposure. Ideal for gift shops, tradeshows, health fairs and much, much more. About this Tek Tissue:This convenient wallet size tissue package includes 10 pieces of 3 ply tissue. An excellent give away for tradeshows, hotels spas, health fairs, hospitals, and much more! About this BioAd(TM) Tissue Dispenser with Kleenex(R) Brand Tissues:Contains: 15 ct. Kleenex® brand tissues. Refillable.Special Instructions:Rush Service: Limited to 1000 pieces or less. One Color imprint in primary imprint area. Standard imprint colors only.Metallic Gold and Metallic Silver not available on paper insert items. PMS Color match and Q-Color not available. About this Facial Tissues:This mini travel tissue pack fits right in your pocket. It features 10, 3-ply tissues in a completely clear package for maximum logo visibility. A great gift or giveaway for health facilities and fundraising events, tissue packs are a great item to have on hand at all times! Made in the USA. NOTE: Product comes with Prop 65 warning label when shipped to California. Label reads: "WARNING: This product may contain carcinogen, which is known to the State of California to cause cancer. For more information, go to www.P65Warnings.ca.gov. About this Tissue Box Sleeve - Paper Products:The custom standard size tissue box holder made of sturdy 20 pt. board stock, is a great way to put your logo right under their noses! Great for doctor's office, hospitals, medical offices, funeral homes, dentist office, churches, schools, business meetings and much more.Material :20 pt. high density white paper board.Special Instructions:This picture may reflects a four color imprint and additional fees need to be applied. Minimum 500 for Four Color Process. About this Facial Tissues:Blow away your customers with this convenient promotional product! This mini pocket travel tissue pack contains 15 two ply tissues. A great gift or giveaway for health facilities and fundraising events. NOTE: Product comes with Prop 65 warning label when shipped to California. Label reads: "WARNING: This product may contain carcinogen, which is known to the State of California to cause cancer. For more information, go to www.P65Warnings.ca.gov. About this Can - of - Wipes:Antibacterial disposable wipes in a beverage can sized container with snap closure lid. Gently scented, alcohol-free formula. Each can contains 50 wipes and meets FDA requirements. Designed to fit in most car cup holders. About this Antibacterial Pouch Wipes - Doctor and Nurse:Antibacterial disposable wipes in a re-sealable foil pouch . Gently scented, alcohol-free formula. Each pouch contains 15 wipes and meets FDA requirements! About this Tissue Box: This tissue pack contains 40 two ply tissues. Imprint your company name & logo on the white box for health and wellness promotions. Makes a great giveaway for hospitals, urgent care, health facilities, fundraising events and more! NOTE: Product comes with Prop 65 warning label when shipped to California. Label reads: "WARNING: This product may contain carcinogen, which is known to the State of California to cause cancer. For more information, go to www.P65Warnings.ca.gov. About this Travel Well Sanitizer Wipes Key Chain:30 Antibacterial Alcohol Free Wipes In Canister. Wipes Made From Non-Woven Spunlace. Features mini metal bead chain. Thank you Joanne, Karen and Suzanne for your reviews. We are glad to hear how well our promotional Mini Tissue Pack is going. They're our top selling personalized tissue packs in this category! 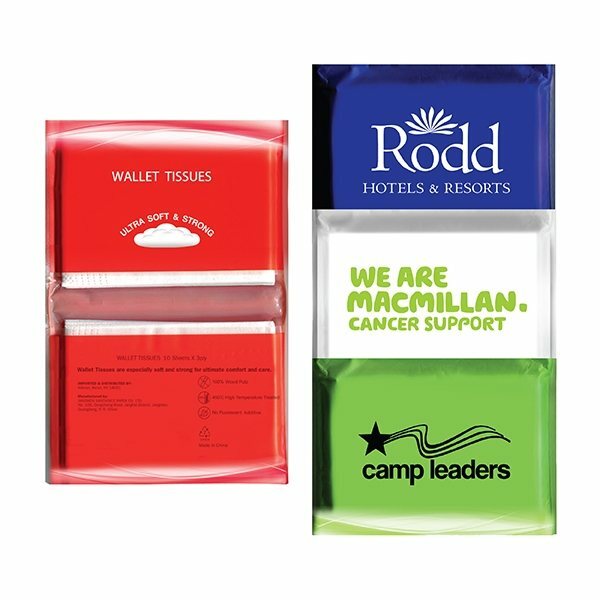 Don’t miss out on giving this promotional Mini Tissue Pack at your next event! Customers will be able to carrying this around in their pocket or purse. Mini tissue pack in resealable PE plastic pouch. Includes ten 3-ply tissues (approx. 7 7/8"x 8" each). Perfect size to carry in your pocket. Thank you Marsha and Katie! Our Promotional Mini Tissue Packets are popular with many customers, because the size makes the packet super convenient! Mini Tissue Packets are great to give at any wellness and safety event! Customers will love to have these at their disposal. Order your Mini Tissue Packets here. Thank you Tyler and Larry! We’re glad to read your positive reviews on our Tissue Pack. As you can see, in this category, tissues are a hot seller. You can’t go wrong with this Tissue Pack. Promotional Tissue Packs are great as a marketing tool. Don’t miss out on this opportunity! 10 tissues in each pack. Stock FDA info printed inside. With our selection of promotional facial tissues, the quality is so soft, you won’t want to remove these from your face! We have mini tissue packs, facial tissues, wet wipe canisters, wet wipe packets, moist towelettes, and more! Want to help your customers with their personal hygiene? Promotional facial tissue is the marketing tool you need. Give your customers the wipes or tissues that will give them a soft comfort. Promotional facial tissues are perfect for makeup trade shows, wellness events, and even to your own employees during flu season! Look through our selection of facial tissues. Shop here! 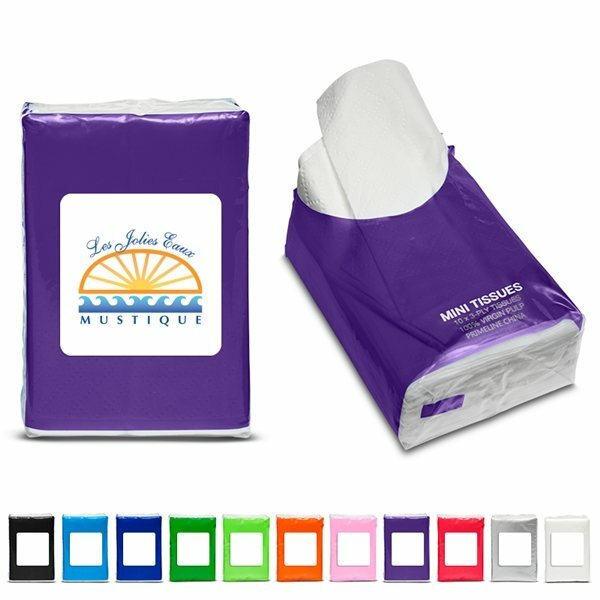 Our durable custom facial tissue is specially priced and professionally packaged to promote your brand in the best light. Search our site for a great selection of tissue, sani wipes, and more! See for yourself just how high AnyPromo’s standards are when it comes to brand impact. Click through our inventory of promo facial tissue items on sale now. Here is a snapshot of our selection of custom tissue products currently available. We’re ready to help expedite your order, so give us a call! Promotional facial tissue helps promote wellness and safety at any event that revolves personal hygiene. Your customers will love the thought when given promotional facial tissues. Facial tissue are absolutely perfect for makeup events! Customers are there to see the makeup, but at the end of the day, the makeup has to come off. Clean your face with facial wipes. Our featured list of facial wipes are currently trending in this category. Don’t miss out on our selection!